The beluga's closest living relative is the narwhal. Beluga whales are named after the Russian word for white. Belugas are the only whales that can bend their neck. The beluga's nickname is the ‘sea canary’ due to the wide variety of sounds they make. Belugas are harvested by Alaska Natives living in coastal villages from Tyonek in Cook Inlet to Kaktovik in the Beaufort Sea. Hunting is done in spring as whales travel northward through leads in the ice, as well as during the summer and autumn open-water period. Belugas are principally used for human consumption, either as meat or “maktak,” which consists of skin and the outer layer of blubber. The oil is used for cooking and for fuel. Beluga bones are sometimes used in crafts. The meat may also be used as dog food. Alaska Department of Fish and Game (ADF&G) is currently participating in studies of beluga whales in Bristol Bay and Cook Inlet. ADF&G scientists are using satellite tags to monitor year-round movements of belugas and determine which habitats are most important to them. They are also conducting health assessments to obtain baseline data for a healthy, increasing wild population. This information can be used to monitor the continued health of this population in the future or to compare to other populations to determine potential threats. 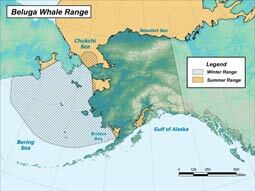 Another beluga research project in Bristol Bay is a genetic capture-recapture study. The results from this research will be used to estimate population size and may provide other valuable information. 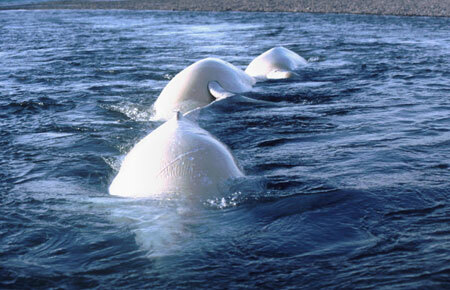 For more information on beluga research see Beluga Studies in Bristol Bay. ADF&G is currently collaborating on an acoustic monitoring project in Cook Inlet to evaluate seasonal habitat usage by belugas.